Since independence from Spain, a trope has remained pervasive in Latin America's republican imaginary: that of an endless antagonism pitting civilization against barbarism as irreconcilable poles within which a nation's life unfolds. This book apprehends that trope not just as the phantasmatic projection of postcolonial elites fearful of the popular sectors but also as a symptom of a stubborn historical predicament: the cyclical insistence with which the subaltern populations menacingly return to the nation's public spaces in the form of crowds. 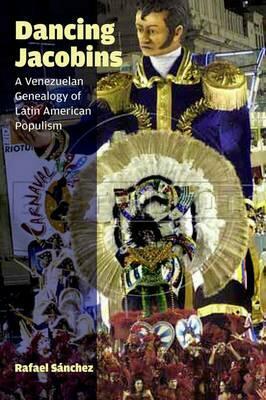 Focused on Venezuela but relevant to the rest of Latin America, and drawing on a rich theoretical literature including authors like Derrida, Foucault, Lacoue-Labarthe, Nancy, Lyotard, Laclau, Taussig, and others, Dancing Jacobins is a genealogical investigation of the intrinsically populist "monumental governmentality" that in response to this predicament began to take shape in that nation at the time of independence. Informed by a Bolivarian political theology, the nation's representatives, or "dancing Jacobins," recursively draw on the repertoire of busts, portraits, and equestrian statues of national heroes scattered across Venezuela in a montage of monuments and dancing-or universal and particular. They monumentalize themselves on the stage of the polity as a ponderously statuesque yet occasionally riotous reflection of the nation's general will. To this day, the nervous oscillation between crowds and peoplehood intrinsic to this form of government has inflected the republic's institutions and constructs, from the sovereign "people" to the nation's heroic imaginary, its constitutional texts, representative figures, parliamentary structures, and, not least, its army. Through this movement of collection and dispersion, these institutions are at all times haunted and imbued from within by the crowds they otherwise set out to mold, enframe, and address.